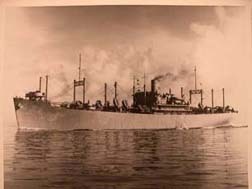 On the evening of Feb. 2, 1942, an unarmed tanker with 66,000 barrels of crude oil on board was steaming in the Atlantic, about 90 miles off Ocean City, Md. Without warning, it was struck by German torpedoes. The attack set the W.L. Steed ablaze, and sank it; only a handful of the crew of 38 survived. As World War II unfolded, the Germans had moved part of their sub pack west to attack shipping along the coast. By the time the Nazis withdrew the subs in July to focus on convoys crossing the North Atlantic, they had sunk 397 ships in U.S. coastal waters. That wartime legacy has become a new environmental problem, raising concern about leaks from the W.L. Steed's sunken fuel bunkers and cargo - and from many others like it. The National Oceanic and Atmospheric Administration is taking an inventory of more than 30,000 coastal shipwrecks - some of them casualties of the 1942 Battle of the Atlantic - and identifying those that pose the most significant threat. "We're starting to see significant corrosion. Vessels that weren't totally torpedoed didn't break apart and may have intact fuel tanks," NOAA's Lisa C. Symons said. It's not just the ship's own fuel bunkers, either. Many, like the W.L. Steed, sank with holds filled with crude oil, fuel oil, diesel fuel and explosives. Leaks of those products "could devastate coastal communities and coastal environments," Symons said. So far, the worst-threat list has been narrowed to 233 vessels, said Symons, damage assessment and resource protection coordinator for NOAA's National Marine Sanctuaries office in Silver Spring. The final list will be submitted by year's end to the Coast Guard. Once priorities are established, efforts to remove the oil from the wrecks could begin, paid through the Oil Spill Liability Trust Fund, which is supported by the oil industry. While NOAA's risk assessments are not complete, Symons did identify five sunken ships - four within 60 miles of the coast - that could make the list as environmental threats to Maryland.